Millions of Americans wake up every morning with jaw pain. If you notice tenderness in your jaw, pain when you bite or endure frequent headaches, make sure to schedule an appointment with your dentist. Although some causes of jaw pain are temporary and go away on their own, you may be experiencing the first symptoms of a serious dental problem. Jaw pain is caused by a variety of issues. You might have a sinus problem or arthritis in your jaw. Your dentist can often tell what’s going on by checking your teeth and looking at X-rays. Teeth grinding – You may be unaware you’re grinding your teeth because you’re asleep when it happens. 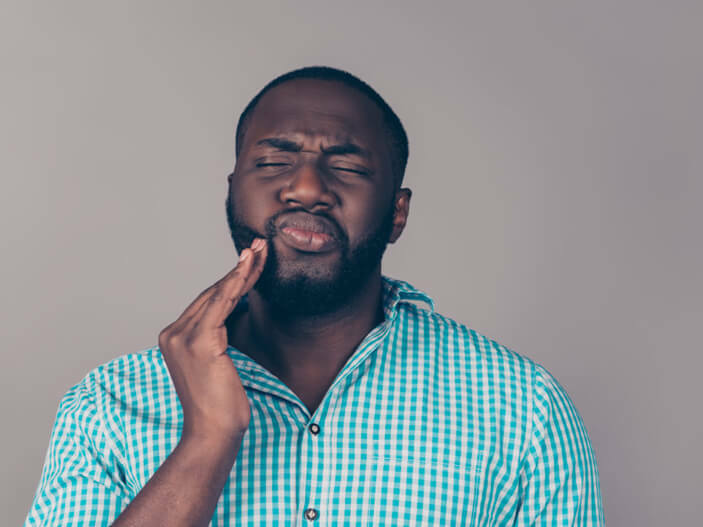 Over time, teeth grinding and jaw clenching can lead to cracked teeth, tooth sensitivity and bite problems. Wearing a custom-made night guard can protect your teeth and prevent jaw pain. Periodontal disease – Also known as gum disease, periodontal disease leads to gum recession, loose teeth and, ultimately, tooth loss. At Konikoff Dentistry, we offer scaling and root planing, a non-surgical treatment to treat infected gums. Temporomandibular joint disorders – Pain that radiates into your face, jaw or neck could be caused by TMJ disorders. Reducing your stress, using relaxation techniques, applying ice packs and not chewing gum often help reduce pain. Your dentist may recommend over-the-counter pain medicine, a prescription muscle relaxant or refer you to our experienced oral surgeons for treatment. Infections – Untreated tooth decay can lead to abscess and serious health problems. A severe infection under your gums can spread to other parts of your body. Toothache – Don’t ignore a toothache. The sooner you address any tooth decay or nerve root problems, the easier they are to treat. If you need a root canal, we have an endodontist on staff at Konikoff Dentistry to help alleviate your pain quickly. Injury – A bad fall, getting hurt while playing sports and other accidents can all lead to injuries inside your mouth. + Are you having jaw pain? Call our office to schedule an appointment. Konikoff Dentistry has eight locations with three offices in Chesapeake, one in Suffolk and four in Virginia Beach. You can also call 1-800-SMILE-23.